Our church, Humble Area First Baptist Church was blessed with five interns this summer. Interns are always a breath of fresh air in so many ways. Whether it be ministry, music or youth they always come in with a positive attitude and want to not only learn, but assist in any way necessary. We have had a great group this year with a combination of some of our own students as well as people we only met a couple of months ago. Each of their last days will fall during August and we wanted to have them over as a group before they left. 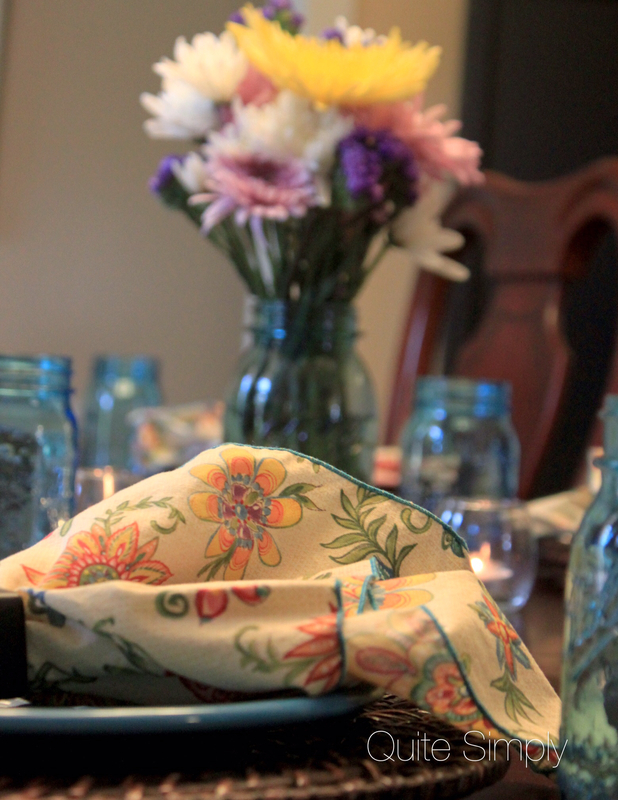 It was a great evening of fellowship, enjoying laughter and stories around the table. A couple of the students had activities to attend after dinner so we wanted to have something easy and uncomplicated. Mr. Wonderful grilled hamburgers having them ready so we could eat as soon as everyone arrived. When serving hamburgers I like to set it up buffet style so each person can add what they want. I have the usual lettuce, tomato and onions, an assortment of cheeses and condiments. 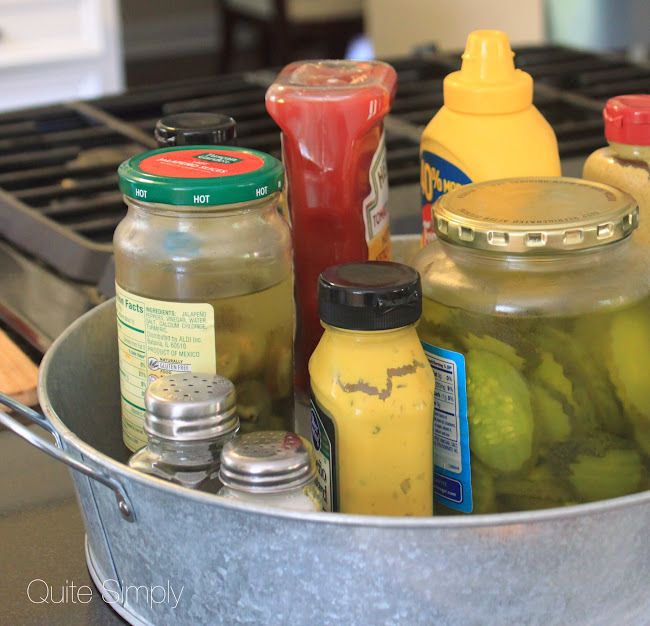 I put the condiments in a tray and try to include various types of mustards, pickles, jalapenos, mayo and ketchup. I want people to help themselves and fix their burger just the way they want it. Hashbrown casserole (recipe here ) and this new recipe for Mexican chopped salad (find recipe here ) completed our meal. The salad was a good side and full of flavor, it complimented the calm flavors of burgers and casserole well. I followed the recipe as stated, except my grocery didn't have jicama and I put a less black beans because my family are not big bean eaters. I certainly recommend you give it a try for your next cook out. 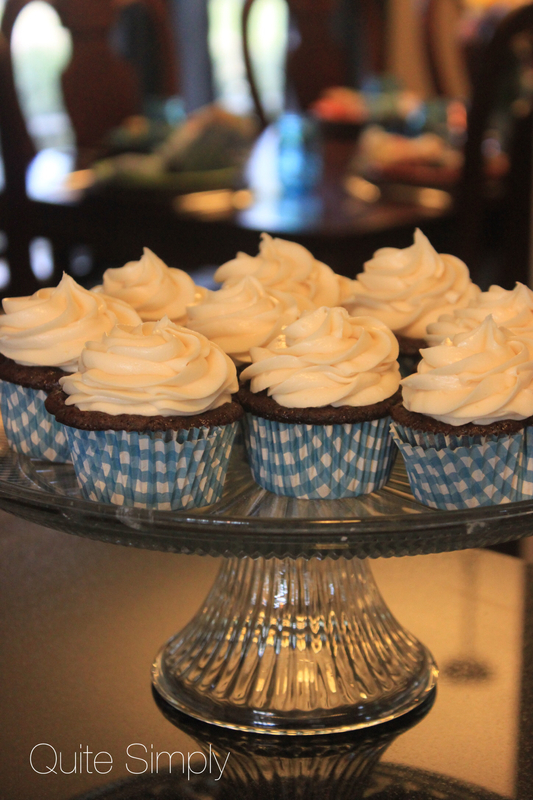 Dessert was chocolate cupcakes with cream cheese frosting. My desire is to encourage you to enjoy sharing hospitality in your home. The meal doesn't have to be complicated. Really we grilled burgers! The fellowship would have been the same if we had deli potato salad and Oreo cookies to round out our meal. The focus should never be on your food, you should always go simple, but the focus should be on the people in your home! So invite someone over, grill a burger and enjoy sweet fellowship! Thanks for sharing! We hosted one summer some interns in our home when the kids were little. Great memories of all the sharing we enjoyed that summer. 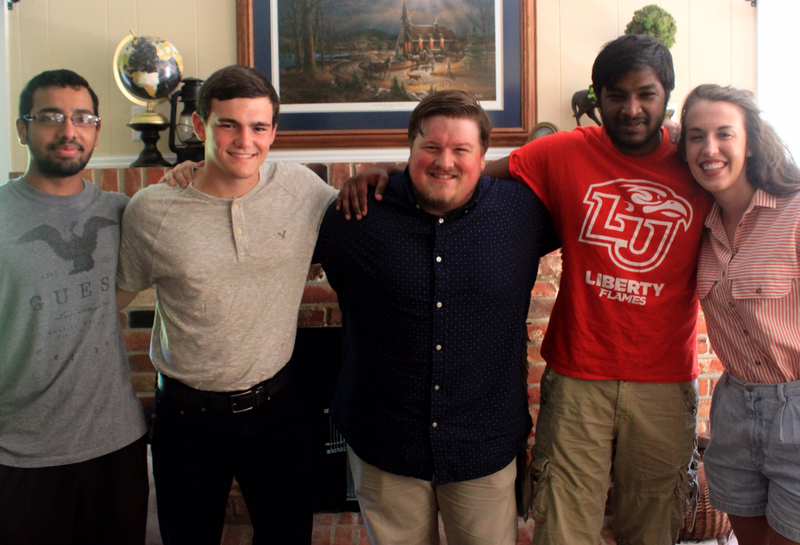 Bless our interns as they move on with their lives. Thanks Dave, we enjoyed our brief time with them!